The book’s spine shows its age. The book’s origins are lost to time. Dean Mortimer says his mother might have added it to the family library somewhere along the way. Or Mortimer might have bought it himself. When he goes to an antique store with his wife, he usually heads straight to the book section. Either way, the collection of folksy century-old verse has become a fixture in Mortimer’s Senate Education Committee. Each Monday, Mortimer starts the committee’s week by reading from his copy of “A Heap O’ Livin’ Along Life’s Highway,” by Edgar A. Guest. He says the weekly readings aren’t just a light-hearted way to break up the humdrum of committee business. They serve as a reminder of what constitutes an education. 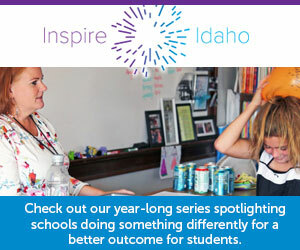 “I think that education comes in a lot of different ways,” said Mortimer, R-Idaho Falls. And that is a lesson Mortimer did inherit from his parents. His father made a point of meeting his 11 kids’ teachers and principals, and didn’t miss parent-teacher conferences. A generation after she attended college – and as the cost of sending children on missions for The Church of Jesus Christ of Latter-Day Saints began to add up — she went into the education profession, working as a teacher’s aide and a reading specialist for about 10 years. Mortimer doesn’t just read poetry. He has written some poetry and limericks — and when the Legislature closed the 2018 session by funding a new statewide reading test, Mortimer recited a 60-second poem on the Senate floor to outline his objections. Mortimer says he has always enjoyed Guest’s poetry, but that’s not a position universally held. Princeton University undergraduates once voted Guest the world’s worst poet, according to eNotes, a Seattle-based website that publishes study guides. But Guest — a native of Birmingham, England, who eventually worked for decades at the Detroit Free Press — “laughed at his critics all the way to the bank,” as eNotes says. Guest’s poems were syndicated in some 300 newspapers, and he parlayed his fame into a weekly radio show and a weekly TV series. His 1916 collection, “A Heap O’ Livin,’” sold more than 1 million copies. Mortimer’s copy is earmarked with yellow post-it notes, so he can leaf to selections for the 2019 session. This will be the fifth year for “A Heap O’ Livin’” in Senate Education, and Mortimer figures he has just enough new poems to get through one more session. And Mortimer says he has gotten enough encouragement to go cover to cover. “I haven’t had anybody get up and object,” he said. Sen. Dean Mortimer holds two powerful assignments. He will chair the Senate Education Committee while staying on the budget-writing Joint Finance-Appropriations Committee.